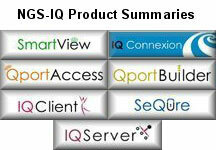 "NGS-IQ facilitates analysis of historical data back to 1999 for trends, past performance of customers and vendors, and projects future activity. Our customer report identifies the top 75 customers to target with specialized marketing efforts and to manage/track future sales opportunities. Our margin erosion report determines if the current selling price is reflecting current actual costs so that adjustments can be made promptly." "SmartView's multi-dimensional, drill down analysis enables our Purchasing Manager to pinpoint our biggest selling items and their vendors to consolidate product lines and purchase higher volumes from one vendor at a lower price, leading to cutting overall costs for our company." "Our Vendor Performance Report for Shipping provides trends of late shipments to establish benchmarks." "We enjoy on-going savings of thousands of dollars in elimination of custom software modifications. Prior to NGS-IQ, we were spending $15,000 for a programmer to create custom invoices, purchase orders, and bills of lading."